There could be numerous reasons why you are lacking the sound sleep. One of them could be just a wrong weight of the blanket. According to researches, a blanket weighing 10% of your body weight can help in relaxing your nervous system and reduces the stress by stimulating the feeling of being hugged. Anjee Weighted Blanket works exactly on this Deep Touch Sense therapy. Made of premium material, it is available in 15lbs weight for individuals between 130-150 lbs. Its inner layer is made of 100% high-quality cotton. The hypoallergenic, odorless and non-toxic filling ensures it is safe on your skin. Its sand-size pellets are dense to add weight and softer to provide a nice texture to the weighted blanket. But this doesn’t mean that it needs special care. You can wash and dry it at home as it is machine and dryer safe. Are you specifically looking for a blanket that can be beneficial to young and old equally well? Here is one of such products that can provide numerous benefits to your teens and adults, from reducing stress to helping calm restless legs. The extra weight from the Good Knight Weighted blanket de-stresses and improves the sleep. The blanket is designed to aid in sensory conditions like ADD, ADHD, sleep disorders and anxiety. With quality materials like 100% pure cotton fabric and inner poly-pellets that are non-toxic and evenly distributed in its square, it is skin friendly too. Sized XL 60”x80”, this blanket can perfectly fit anyone who is up to 6’6” tall. It is in line to the suggested weight by researches and studies for the individuals up to 150-200 lbs. 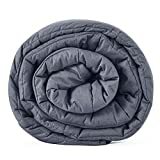 Driven by the motto of Better Sleep, Better Life- this YnM weighted blanket is available in different sizes and color. So now, you can enjoy more restful sleep as it can match your home décor requirements too. It has the 7-layer system that gives you cozy cover and fits your body shape. It has more glass beads, and fewer fiber fills which offer better temperature control, and better sleep therapy for adults or kids with anxiety, autism, ADHD, insomnia or stress. With this blanket over you, you’ll feel the gentle sensation of being held to get deep and healthy sleep. Each compartment is sewn with topnotch sewing technology to ensure durability. The glass beads are sewn into place to prevent movement and noise while you catch your precious Z’s. You can now have added reason that guarantees sound sleep and rest. For, ZonLi Cool Weighted Blanket is available in all the three sizes to suit your twin, queen, or king sized bed. It is made of 100% breathable and natural cotton. This makes the blanket cozier and durable than others. Its filling comprises of environmental non-glue polyester padding and hypo-allergenic, non-toxic, odorless Glass Beads. The two-layered microfiber inside prevents the glass beads leakage and temperature growing too hot. With smaller squares, the weight of filling is distributed evenly inside the blanket. Thus, it can provide considerable relief to the people with disorders like Insomnia, Autism, Stress, and Anxiety. Great in feel and touch, this blanket is made of 100% Breathable Natural Cotton. It is engineered to be around 10% of a person’s body weight to naturally relax the nervous system. It reduces your tension by making you feel as good as being held or hugged. This scientifically proven therapy works wonder as a natural treatment for Anxiety, Stress, Insomnia, PTSD, MS, ASD, SPD, ADHD, and more. 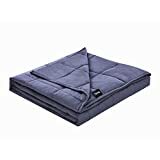 Size 15 lbs blanket is suitable for 90-150 lbs individual, size 20 lbs for 150-200 lbs individual, and size 25 lbs blanket is recommended for 200-250 lbs individual. The material used is at par latest trend. It has medium-sized compartments which make its weight evenly distributed and a perfect fit for your body. Breathable fabric and non-toxic, odorless glass beads ensure just right temperature inside. What more? You don’t have to pay laundry bill, for it can be washed in your washing machine on a low-gentle setting. If you don’t wish to rely on the washing machine, you can even hand-wash it. Are you looking for the deal offering a duvet cover along with the blanket? Then, you have clicked the right product link. The Quility weighted blanket includes a removable, fleeced cover. The cover has as many as 10 buttons along the perimeter. Thus, it can be secured in its place giving you relief from the hassle of stitching. Removable cover not only facilitates cool temperature during summer but also eases off doing laundry at home. Just remove the duvet cover, machine wash, and air dry. The 100% cotton fabric is filled with non-toxic, hypo-allergenic plastic poly pellets. The small squares stitched all over the blanket prevent dislocation of the pellets contained inside. Thus, shape and form stay intact for long. Being heavy, it triggers the release of serotonin and the sleep hormone, melatonin. As a result, it boosts your mood as well as helps you to fall asleep quickly. Its Deep Pressure Therapy helps to combat mild to severe symptoms of anxiety, insomnia, ADHD, Restless Leg Syndrome, and PTSD. The effects of weighted blankets are natural, and therefore, often used as a supplement to treatment or an alternative to medication. 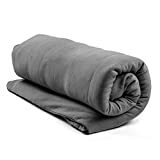 Available in three cool colors and sizes, this blanket is made of 100% Premium Breathable Cotton to give you a smooth touch along with restful sleep. Its compartments have hypo-allergenic, non-toxic and odorless Glass Beads filled in a manner to ensure no unevenness or lumps. Close stitches are made using a durable cotton thread to keep the filling intact and prevent beads from coming out. A fit size and weight of the blanket will help you feel relaxed as it will calm nervous system releasing stress or anxiety. You can cover yourself under it and enjoy its gentle touch whether you are relaxing, reading, or meditating. Have you been longing for a deep, stress-free sleep? Your wait is over. It is time to get cuddled by the Good Knight weighted blanket. Its de-stressing weight therapy will calm down your anxiety and improve the overall quality of sleep. It is made from 100% premium cotton to ensure smooth and skin-safe product for you. The tiny poly-pellets fillers are non-toxic. They are evenly distributed to avoid lumps. The blanket is designed in such a way that it can help patients having ADD, ADHD, sensory, sleep disorders, or anxiety. 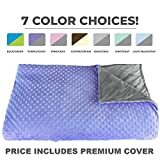 Offering you as many as 7 color choices, the Premium Weighted Blanket is truly a “Calmforter”. It is made by industry exclusive Evenflow Technology which makes the blanket not only comforter but also a helper in calming your anxiety. It has an ingenious Cloudsoftpolyfill and Stardust mini beads so that you can enjoy its quiet, even pressure reminiscent of full body hug. On one side it has ultra-luxurious fabric cover that gives a silky-soft touch, on the other, it has unique SensaCool Dot System that provides you cool and comfy feel. Now you can say “No” to old, cumbersome process of washing the entire blanket that takes forever to dry and wears out quickly as the weights are repeatedly washed. As, this blanket has the outer cover that can be easily zipped apart for fast, easy washing and quick drying. Has quilt been your favorite pick when it comes to blankets? If so, Kpblis Weighted Blanket is just the right choice for you. It is made by using advanced quilting techniques and quality materials. This ensures no tatters or leakages. The fabric used is soft and breathable. The filling inside is of eco-friendly glass beads. It will help you show your gentle care to dear ones with sleeping disorders or anxiety, stress, ADHD or autism. This weighted blanket will provide soft, silky and comfy hug gentle enough to let them sleep fast and sound. Weight: Finding the perfect weighted blanket starts with choosing the right weight. As recommended by some studies, choose the blanket that weighs about 7%-13% of your weight. 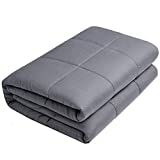 A weighted blanket needs to be on the top of the mattress and should not go over the edges of your bed. 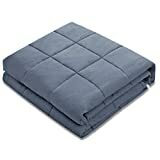 Size: This feature of a weighted blanket does play an important role in providing convenience. Recommended sizes are: 48”x72” for Twin sized bed, 60”x80” for Queen sized bed, and 80”x87” for King sized bed. As these kinds of blankets are weighty, it is wise not to choose an oversized blanket. Comfort: When using for children or seniors, ensure that the individual has enough strength to move the blanket off by self when needed. Pregnant women and children under 5 should avoid using such weighted blankets. Working hard for the whole day brings a great deal of stress, anxiety and other problem. To get effective treatment and relief from these you need to seek something that’s effective and works without causing any harm. This is right for the weighted blankets that let you get the best sleep each day. Our list includes the best of those choices that are known for their quality and rule the market. Grab one of them and enjoy a relieving sleep that wakes you up with a fresh mood every day.